RonE asked the Windows forum why Windows 7's XP Mode can't see other computers on the network. It can access the Internet. Windows 7's XP Mode, part of the Windows Virtual PC, allows you to run a separate version of XP inside the newer OS. The Virtual PC comes as a free but very large download (after all, it contains a complete copy of XP) that works in the Professional and Ultimate editions of Windows 7. If you've got Windows 7 running nicely on your network, with access to the Internet, networked printers, and shared folders on other computers, XP Mode is going to initially disappoint you. You'll probably get the Internet just fine, but not your local network. You'll have to set up XP for the network separately. But first, you have to tell Windows 7 how XP should access the network. If you're currently running XP Mode, exit it before going to this step. In Windows 7, click Start, type virtual, select Windows Virtual PC, and press Enter. This opens a Windows Explorer window to the Virtual Machines folder. Right-click the Windows XP Mode file and select Settings (not 'Properties'--that's an easy mistake to make). In the left pane, select Networking. 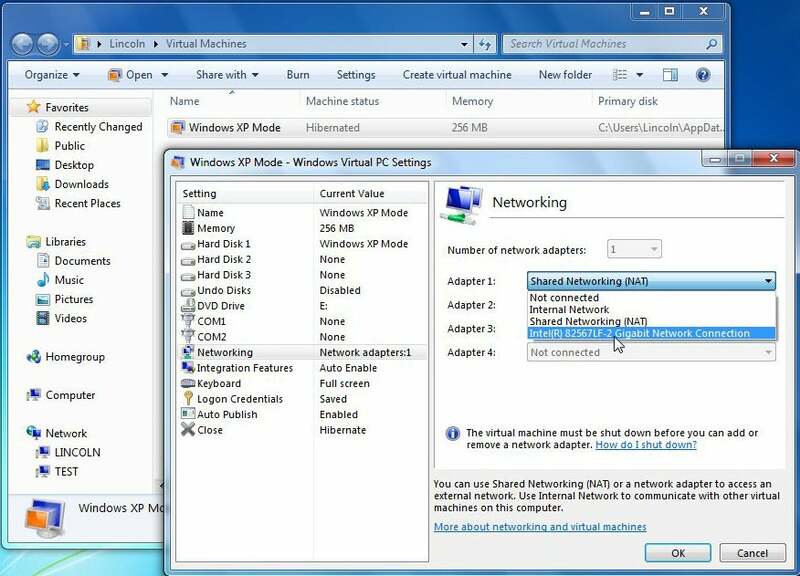 In the right pane, for Adapter 1, select your network adapter. Click OK . When the dialog box is gone, load XP Mode. You can do this from that very same Explorer window by double-clicking the Windows XP Mode file. In your virtual XP environment, select Start, then Run, type netsetup and press Enter. Click Yes at the 'want to continue' dialog box. 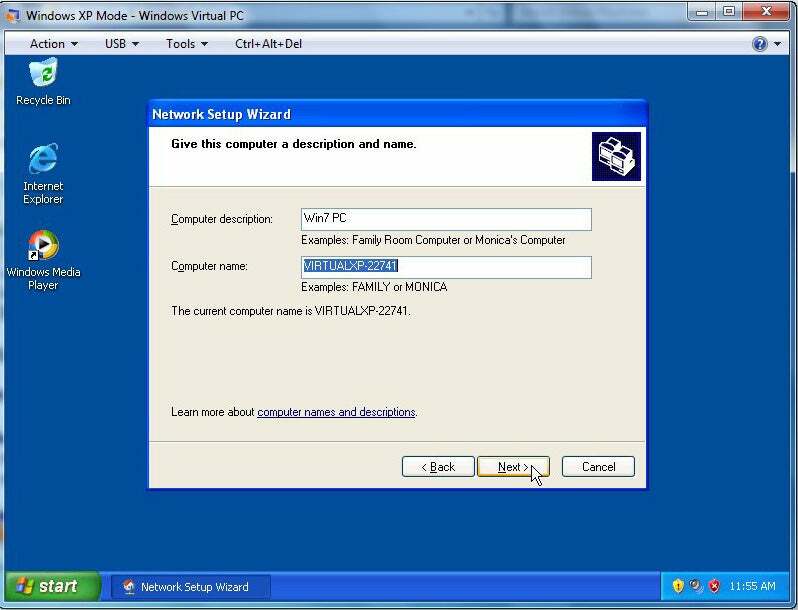 1) Make sure that the Computer Name you enter is different from the one you use for the same computer's normal, Windows 7 environment. 2) Be sure to use the same Workgroup name that other PCs on the network use. 3) Turn on file and printer sharing. If it still can't access the network, you likely have some other network problems. See Why Can't My PCs see each other on the network? They can all see the Internet? for additional advice.